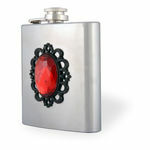 pewter flasks with precious stone, skull, fairy, pentagram, dragon and Dante designs. 6 oz. 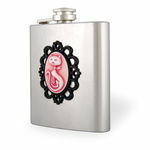 stainless steel flask with pink resin cats meow cameo. gothic boots, platform boots, platform shoes, creepers shoes and more.